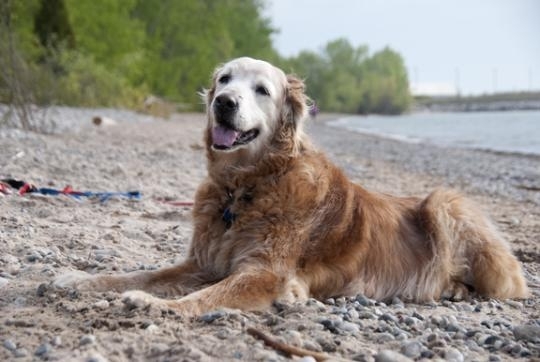 As you might have read, Comet has gone to the Rainbow Bridge. She spent the last year and a half dealing with vestibular disease. She would have episodes and bounce back, but unfortunately it didn't happen as quickly the last few times. She came into foster care two years ago. We found out quickly that Comet liked barbecued food. Like a magic elixir, the hard years disappeared completely in those moments. With a late start in life no fault of her own, she charged into the remaining time armed with love, forgiveness, healing, and cuddles that rivaled the best in history. How she could give spoke to her unending faith in the good. She was rewarded time and again with love from young and old, human and creature alike, and respect for her frail condition. Just seeing the wind blow in her hair, you knew no matter what happened, it was going to be all right. She loved going to the beach and laying in the warm sun. Toward the end, on her own, she thought she’d give the water a try and liked it. We will always remember that big smile, as big as Texas, when a wave said howdy, pleased to meet you. Also in the never forget category: how fast she could eat an ice cream cone. Those memories comfort when her loss brings tears. Comet helped pay it forward at GRRoW events. For the past year she has also visited residents at an assisted living facility. We hope she knew how much she was loved, but know she knows how much she is missed. Sweet Comet, baby cakes, run free. We can't wait to see you again. Please help us remember Comet by purchasing a 2019 GRRoW calendar. If we sell all 200, the invoice will be torn up, and GRRoW won’t need to pay it. Please tell your family and friends too. Here is a link to the page https://www.grrow.org/shop/2019-grrow-calendar. Thank you for supporting Comet’s Challenge.